While coming up with the image for the heading on this blog I was thinking about Schellville Airport (aka Sonoma Valley airport). 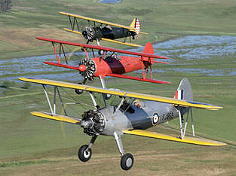 I remember going out there many years ago and taking a ride in one of their biplanes. It was an incredible experience. Leather cap and goggles, open cockpit, flying out to San Francisco bay. They even did a loop and a roll on the way back. The prices have gone up quite a bit. I believe I only paid $30 back then. The same ride now it $175, but I’m sure it’s still worth it. I saw on their website they have a Display Day on the second weekend of each month. I’m going to try to make it out there next month (6/12 – 6/13). They have a nice collection of vintage planes. Should be fun!